While some of our customers and associates are experienced BR Developers, we also work directly for consumers as well. These are the owners of small businesses that have been around for years, that bought custom software often in the 80s or early 90s to run their businesses with (but some as early as the 70s on the IBM System 32 Mainframe). A lot of that software was written in Workstation Basic and these companies continue to run their businesses on that software today. Many times the original programmer has long since retired and they have no access to support for the software, or any idea of how to maintain it, or get it running on modern computers. Many of our current customers came to us with software someone wrote for them long ago, software that had their entire business records in it, and for which they could find no support. Some of them were still running on 286s because they couldn't get the software running on anything newer. They were running out of perforated paper for their dot matrix printers. All the development that has gone into Business Rules for the past 10 or 15 years missed them because they no longer had someone actively updating and supporting their application. 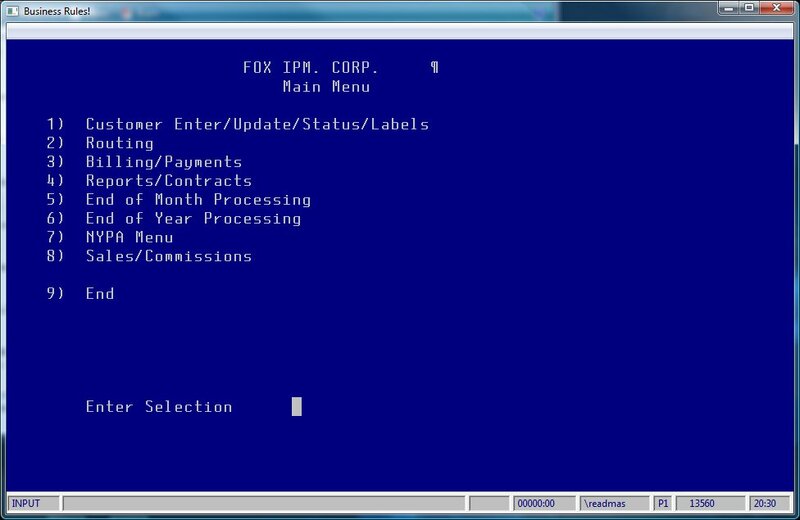 In the first session with someone, we are able to get their old WB software running under the latest version of Business Rules on any modern operating system including the most recent versions of Windows, Mac OS, and Linux. This upgrade brings with it support for modern printers, so you no longer have to keep finding ink for the dot matrix printers that so much of the older WB software was written for. We can enable newer features such as "Print Preview" that lets you preview your print jobs on your computer before you waste the time and paper printing them. After that, for those of our customers who want more, we work with you to make further improvements to your software. We can fix old bugs you've been dealing with. We can rewrite the programs you use most often to make them more powerful and more effecient and easier to use. We can introduce new capabilities into your accounting system that you've long desired. With our team of experts, there is no limit to what we can do for you. 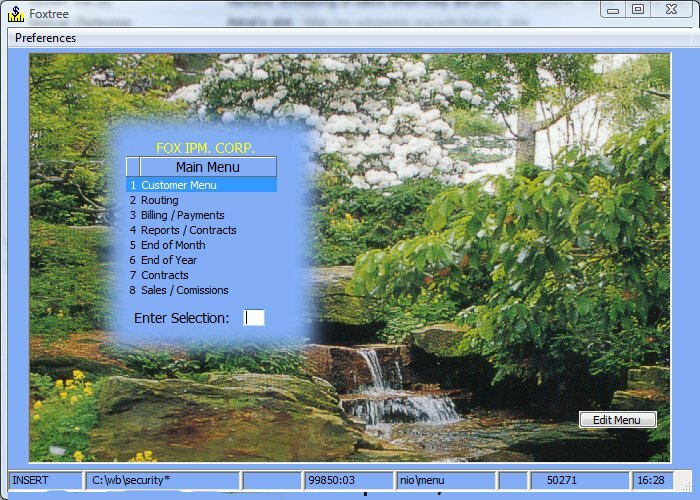 Here are some pictures of our customers' software when they found us, and the improvements we made to it. The first thing we did when they found us was get them running on a modern server with modern usb printer support and a better networking setup. Then we gave the secure access to their software over the internet. 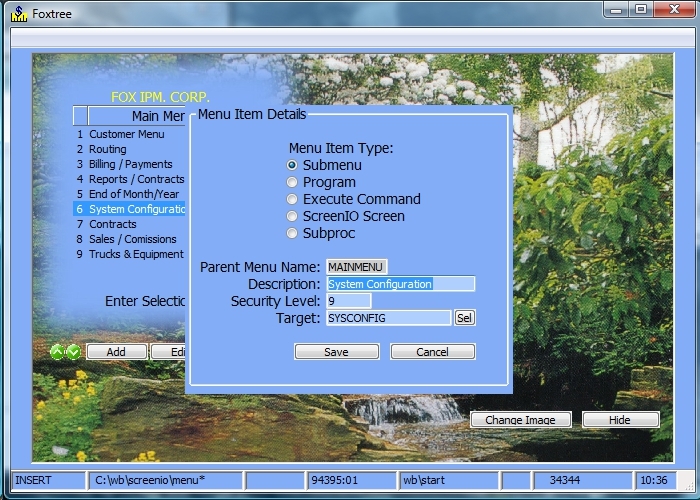 Finally, we rewrote a few of their more commonly used programs, including a menu and their Customer Master Maintenance program. Above you can see the before picture of the menu. Below, you can see the after picture of the menu. The new menu also properly supported the windows X which meant their computers were able to shut down properly more easily. The new menu supports 100 % of the keystrokes that the old menu used, so there was nothing new for them to get used to. From this menu (above) if you selected "Change" you could enter the customer number only if you knew it by heart. Otherwise, you tabbed down to the "Search" field and entered part of their name. This search text had to match the beginning of the name exactly in order to find the records. From here, they could select one and edit it (below). We replaced that whole search mess with a nice simple searchable sortable listview. The program starts out by showing them a list of customers. If they start typing part of a customers name, or phone number, or any other detail, the list filters in real time to show only the matching customers. If they select a customer and click the "Edit" button, they're taken to the Customer Edit screen. Whereas before they were given 4 screens that they had to process through, one after the other, in order, we gave them four tabs that they can look at, or not look at, in any order they desire. Y/N flags are replaced with checkboxes. Proportional fonts make it easier on your eyes after the long hours at work, and everything is made simple, intuitive, and easy to use. The newer programs are faster and more reliable because they run on modern computers. They're easier to use, and more effecient, because you're able to use the mouse, and view things in searchable, sortable, printable lists. They're more intiuitive and easier to learn, so you spend less time training your staff. They print on modern printers, so you no longer have to search for hard to find dot matrix ink and paper. They can print directly to pdf files, and you can preview reports before printing them. All of these benefits add up to an immeasurable increase in productivity for you and your staff, along with the security of knowing that if something goes wrong with your software, there is someone you can call who can help, and the reliabity of being able to run your custom business software on todays modern servers. The first thing Foxtree wanted was to be able to print to USB printers without having to use a hacky buggy 3rd party aftermarket print driver, and to replace their aging server. We got them set up with the ability to print to any printer they wanted, helped them get their software running on a new machine, and then linked their three offices together to the same server, so that everybody could work together more efficiently. We integrated some of their programs with google maps, simplifying scheduling and routing, and reduciing the amount if time it took to scedule the routes from 4 hrs down to about 30 minutes. We integrated their software with google calendar, linking the entire sales force and work crews via their cellphones. And we set to work making their programs easier to use, one at a time. This was the first screen of the old customer program. They would have to know the account number of a customer in order to edit one. If they didn't know, there was a different program they could run that would print a report of the customers, and from there they could read the account number and remember it. After entering the accout number, they were taken to the following (first of 6) screens where they could edit the customers details. The screens had to be entered one at a time, and if you accidentally went past the screen you wanted to change something on, you had to exit the program and start over again from the beginning. Again, we replaced that whole messy Account Number business with a simple, elegant and fast, searchable sortable printable listview. Now, they simply select the customer they want (or search with the search box) and click "Edit". They're taken to the Customer Edit screen where the 6 screens have been changed into 6 tabs that can be accessed in any order. Tooltip text guides them through the process, and everything works in a natural and intuitive way. The new programs have been such a success that the owner of the company no longer has to spend as much time training his guys and doing the accounting and is able to spend more time living life. And with the availablilty of Remote Access built directly into his programs, he's able to connect even when he's away. 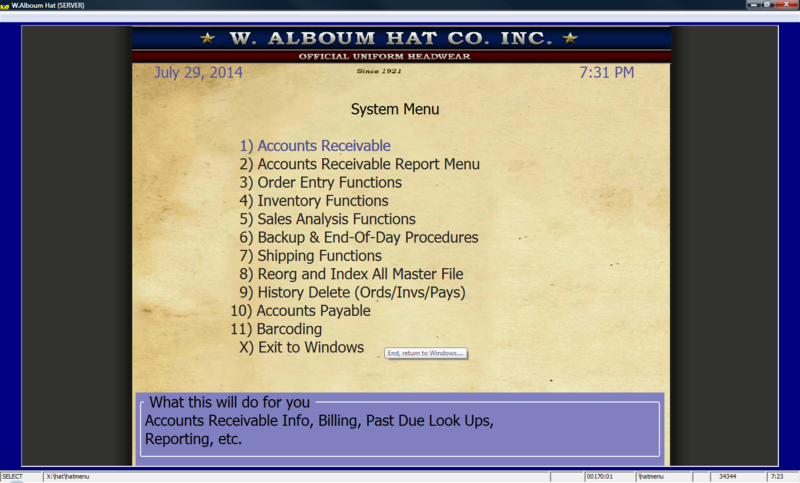 Here is a custom menu we designed for the Alboum Hat company.